When Collections Specialist Amanda Pettit considers options for a repossessed vehicle, she always works to reduce expense to the membership and the hardship on the member who purchased the vehicle. Recently, Amanda was faced with two vehicles that needed a large amount of expensive repairs to be considered available for sale, repairs that would cost more than they would return in value. That’s when Amanda realized where the credit union could do the most good, and contacted McMinn County’s Career and Technical Education department to donate the vehicles to the school. 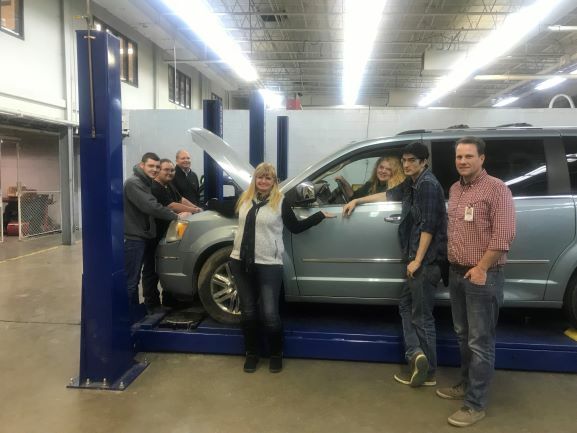 Instructor Craig Bowers and Principal Kevin Edwards worked with Amanda to get the vehicles delivered to the school, where around 120 different students will have the opportunity to gain hands-on experience by working on the vehicles. “We get car projects from different sources, usually students and faculty,” noted Edwards. Bowers mentioned that donated vehicles are helpful because the students can take their time learning and don’t have to hurry to return a car to a student who might need it to drive home. “After we’re done, we’ll pass the vehicles to auto body class,” he said.